The trade flow is stated to be unbalanced. The developed economies are most dominant over others like the United States and Germany who are mostly benefitting from the trade flow. It is noted that they have accumulated 40% of the world’s apparel imports over other countries putting them ahead and giving them a better advantage than others. Most developed countries are benefitting from this trade flow including the United Staes and the European Union who have reached 65% value of the world clothing exports between years 2006 to 2016. I believe that this topic is a hot button issue because not everyone is able to have a fair advantage of benefitting. The developed countries are only able to take that leap and prosper while outbeating the least developed countries. While clothing exports are so high in developed countries, there’s rarely any competition for least developed countries. A quick comment on your last point “While clothing exports are so high in developed countries, there’s rarely any competition for least developed countries.” I believe you refer to “Used clothing”–actually these used clothing exports were not made in the developed countries either. Rather, these apparel were mostly made by Asian countries. This creates some controversies about how to regulate used clothing trade. When it comes to the used clothing trade, a huge issue is the high tariffs. Used clothing is inexpensive and therefore attract consumers who want to spend less. This is why the main importers of used clothing are least developed countries. It is likely that these countries do not have a strong, established economy. It is not fair that they must pay higher tariffs to import the used clothing than other, more developed countries pay to import new clothing. LDC’s are purchasing used clothing for it’s inexpensiveness. I believe there should not be tariffs for LDC imports. Quotas would be fair in some circumstances, not tariffs. Regarding the high tariffs for used clothing –It is largely because the government in these least developed countries wants to reduce imports of used clothing and help their local textile and apparel industry to grow. I think there are so many reasons why used clothing trade became the hot-button issue. In developed countries, apparel is largely consumed especially the fast fashion items. Because of the better economic condition, lots of big companies or international appeal brands built in developed countries. Moreover, consumers have more money and willing to spend more money on buying the garment. Therefore, the product cycle is much shorter than before because consumers get new and cheap garments easily and bored with the old garments easily. As a result, many old garments sent to the landfill or the recycling bins. These used clothing mostly export to developing countries because of less favor in developed countries. In some way, developing countries have poor economic conditions so tends to consume low-quality and second-hand clothing which cost less. However, these do not mean that they really want to consume the used garments. It is just because they do not have choices. Also, the large amount of import of used clothing many have negative impacts on their local apparel industry. Consequently, developing countries hope to use high tariffs in order to limit the import of used clothing from developed countries and avoid the disruption of the domestic apparel industry. The developed countries feel unhappy about this. Thus, the used clothing trade is controversial between developed and developing countries. The used clothing trade is such a hot button issue because the developed countries don’t even really want the used clothes. From past research this seems to be such an issue because fast fashion causes clothes to come fast and leave fast and where do they go? usually land fills. I believe this is so controversial because clothing is being produced in these countries and sent to least developed countries thinking that the developed countries are doing some nice deed and helping out the least developed countries but really the least developed countries don’t have much of an interest in these developed countries sloppy seconds. Least developed countries have not seen benefits from importing these clothes and have found that its more hurts them economically and disrupts their own textile and apparel industry. Making the used clothing trade even more of a hot button because then it is time to come up with new alternatives as to what should actually be done with the used clothing and how could everyone benefit from it rather than being hurt by it. I completely agree with you, so many people dont realize what happens to their clothing after they dispose of it/donate it. There seems to be so much extra textile waste in circulation with no where to put it, there should be more big brands who use recycled material. I feel that the used clothing trade has become such a major topic of discussion because there is just so much excess material in circulation. Although research has shown that consumers are now becoming more conscious of their purchases in regards to where their apparel is coming from and the contents in their clothing, at the end of the day there is just too many pounds of unwanted/unused textiles. A large portion of this issue that seems to be left out is how the environment is being effected by all this material. Regulating the trade of used clothing would be easier if there were less within circulation. Although there is plenty of material still to go around, something we can do now is simply buy less. By buying higher quality goods, we get longer use of out them and when were done wearing them often times they’re still in good enough condition to be sold or passed down/traded. So much of this issue lies within the hands of the consumer and the owner of these goods and how they choose to discard of the garments. I think one of the biggest problems in the Fashion and Apparel Industry is that fast fashion is becoming more prominent than ever before. Fast fashion was the first thing i thought of when I began reading about the used clothing trade issue in this article. There are way too many apparel products being put into circulation because of this obsession with fast fashion and having the latest trends at the lowest prices, only for these fads to go out of style and be replaced with the latest and greatest new trend. It is a vicious cycle and a culprit in the reason why we have so much excess clothing in the world. I feel as though the used clothing trade has become such a major topic of discussion for many reasons, but mostly because consumers are just becoming more aware of the danger our environment is in when it comes to landfills and recycling. I think things really took a turn when fast fashion entered the industry. It is in developed countries that fast fashion is consumed and within those countries you have fast lead time, quicker trends coming on and off shelves in store, and consumers who can afford to keep up with trends and constantly buy “the newest thing” and shortly get rid of the “old thing.” This causes the product cycle to be much shorter, which leads to the problem of garments being thrown away in landfills and used clothing trade to underdeveloped countries. Like a lot of the comments above, the problem is that these underdeveloped countries don’t want the used clothing from the developed countries. The developed countries think they are helping out and doing a good deed by supplying those countries in need with clothing, but they don’t want their second hand clothes. The developed countries are out beating the least developed countries because of the tariffs implemented. Clothing exports are so high in developed countries that there’s really not competition for under developed countries. I was unaware that used clothing was such an issue, but it makes sense. Developed countries are the number 1 suppliers of used clothing because they have the disposable income to buy new clothing as they wish. They then donate the clothing when they are finished with it. These used garments are sent to less developed countries with high tariffs. Developing countries can afford these reduced price clothing, which makes it attractive to send the clothing there. But, it is unfair to make developing countries pay high tariffs on used clothing. I was surprised by the trend of the top used clothing importers in the least developing countries. I remembered the article in the reading packet discussed that the developing countries do not really want to import such amount used clothing from developed counties because it interrupts the development of domestics textile & apparel industry, so they added a higher tariff for used clothing imports. However, this method does not seem helpful for the domestic apparel industry, especially when you look at the trend of used clothing imports which is still increasing in these years. Therefore, what should we do with those used clothing? The top used clothing export countries should take a responsibility on this issue, such as reducing the value of used clothing to developed countries or letting more customers to know drawbacks of those discarding clothing they bring in order to reduce the amount of donated clothing. This article has made me think of a few points as well as a few questions I have. It would make sense to me that Europe and the US are the leading the countries in used clothing exports, considering how much new apparel we import and how much more our citizens spend on clothing it is no surprise. Another thing that I had also assumed made used clothing such a hot topic was that most of it does not get used and ends up in landfills, which is harmful for the environment. I had not realized that other issues such as trade impacts would be an aspect of what made it so controversial. A few questions that I immediately thought of was what are these countries that import the used clothing actually doing with it? Are they recycling it for textile production, are they reselling it, and how much of it do they also throw away? I was really shocked by the high tariff rate being imposed on developing countries. I completely agree that fast fashion has been the major downfall of this industry and the reason why the export of used clothing has become so big. People see their clothes as temporary where they used to see them as a piece of art because of the careful construction that used to go into clothes. Buying clothes is almost like a revolving door process with clothes being thrown away as quickly as they were purchased. The used clothing trade industry has been come quite controversial because of high tariffs placed on the imported clothes. The less developed countries have become the highest importers of used clothing and the countries with the highest percentage of tariffs placed. I believe its become so controversial because of the state of our planets environment the increasing issue of pollution. Developing countries have less purchasing power and their main concern isn’t buying the new and latest clothing. Exporting used clothing to developed countries such as the United Kingdom, United States, and Germany, we will be giving the less fortunate countries clothing on their back while decreasing the amount of waste created due to used apparel. Consumers are becoming aware of the importance of garments life cycle and learning how to make it more sustainable. My question is, is if were are doing good by recycling developed countries old clothing, why are we still implementing such high taxes on used clothing? 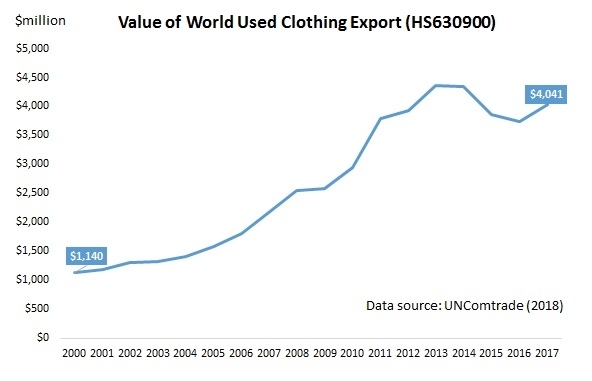 I think the used clothing trade became such a “hot button issue” because developing countries have higher tariffs on used clothing than new clothing because they want to help their local textile industry grow rather than bring in used clothing from other countries. It’s interesting to see that there would be a high tariff on something that people in the united states just donate or throw away. What shocked me was that the average applied tariff rate for used clothing imports was 19.3 percent, higher than 15.4 percent of new clothing, and that just doesn’t seem right to me. I get why developing countries want to keep used clothing out, but I think the tariff should be lowered (even just a little) for the sake of people living in these developing countries not being able to afford the clothes that their local textile industry offers. The used clothing trade is a “hot button issue” especially for the developing countries or underdeveloped countries. We all know this is because what the increasing imports on used clothing restricted the local manufacturing or local apparel company to develop itself inside their country. They has no competitive with used close from developed country. However, without considering the manufacturing and apparel factors in the effected countries, I think this is actually a good thing for its citizens. It is the truth that they could have a cloth with a lower price but better quality than cloth produced by local factories. At the time when used cloth affect the manufacturing and apparel sectors, there are actually more job opportunities are created because of the used cloth trade. So, it just hard to decide, depends on who are you spoken to. The clothing trade is such a hot button issue right because of fast-fashion. Over the past few years, we can see this increase in used clothing exports because consumers are buying more and more, and wearing less and less. Companies are forced to create new trendy clothing to keep with the trends and reach high sales revenues. This leaves consumers with increasing amounts of used clothes. I am not sure if the importance export of second-hand clothing is a justifiable practice considering all of the environmental and sustainability issues when it comes to fashion and apparel. But, the export of recycled clothing is very important to developing countries for reusing purposes. Will it be banned to import by other nations? I feel as though local garment factories are damaged by the large influx of cheap clothing from more developed nations. It is taking the their business away by cutting into their market. From a positive standpoint, importing second-hand clothing is great because it represents such a larger volume and percent of imports in the world. I think the export of second-hand clothing is important because labor intensive countries can produce high-quality pieces to export back to developed countries. This makes me think about fast fashion and the direction that market is going in. While it is understandable, in a way, why LDC’s would want to impose high import tariffs to limit used clothing imports and thus, support their own domestic markets, it is also hurtful to the consumers living in these countries who have high demand for used clothing, but cannot afford to pay much for it. This is why trade is so important for developing countries to be able to participate in. If developing countries would allow developed countries to export used clothing to those who need it, they can in turn make sure that these developed countries do their part to accept imports from LDCs in order for them to support their economies, while still supporting the needs of their people at the same time. I believe that the used clothing trade is such a hot button issue because of how it is directly affecting the economy of underdeveloped countries. The top three importers of used clothing are Pakistan at 6 percent, Malaysia at 5.8 percent, and Ukraine at 4.9 percent. All three of those places are developing countries. While recycling clothing to undeveloped countries seems like it can be only positive for the economy as well as the environment, it also has negative aspects. From a sustainability standpoint, it is much more beneficial to send used clothing away over them ending up in our landfills. However, receiving an influx of clothing hinders these countries from developing their local economies. There should be regulation on how much they are receiving as well as exactly what they are getting. If they are getting clothing that they need, and they are able to develop clothing they are able to develop, then their economy has the opportunity to flourish.